2. Mixed in with pasta. 3. Served over roast chicken. 4. In a root vegetable tart. The grilled bread and pasta dishes are straightforward (see below for simple recipes). And it is great as a topping on almost any meat. 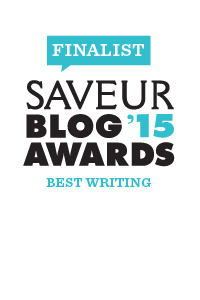 Here's the story of how the pesto ended up in a tart. Because of our Full Belly Farm CSA box, I always have a big bin of root vegetables. Last week I had carrots, turnips, parsnips, onions, and delicata squash. I was in the mood to cut vegetables. I ended up with a huge pile of vegetables and no idea what to do with them. I figured I'd better cook them so I threw them all on a sheet pan with some unpeeled garlic cloves, herbs, salt, pepper, olive oil, and balsamic vinegar. I cranked the heat up to 425°F. About halfway through the cooking time I pulled the tray out of the oven to check on the vegetables and Dash asked, "That for a tart? Yummy tart." Great idea. So we made our first tart of the decade. It might have been good with just the vegetables, but I was worried it would be a bit dry. Plus, I wanted it to be more of a meal instead of a side dish. I had a big jar of chunky feta pesto that I'd made the day before. Dash smeared the bottom of the tart shell with the pesto. Then he scooped on the partially roasted vegetables. 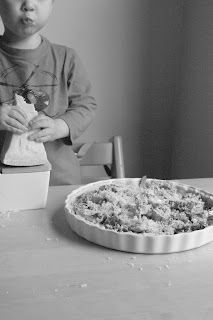 He grated lots of parmesan cheese on top. I told Dash he owed me a dollar because he bit off the ENTIRE tip of the parmesan cheese. He went and got me some plastic money and apologized. Before baking the tart we made a little pile of roast garlic in the center. "That's my tart. MY tart." said Dash. 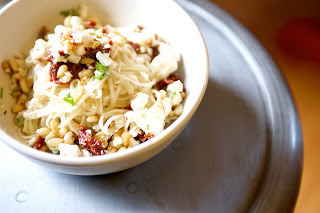 In a bowl, mix together feta cheese, sun dried tomatoes, parsley, olive oil, garlic, lemon zest/juice, salt and pepper. 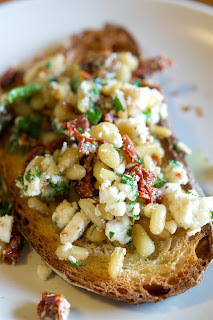 Toast pine nuts in the oven or in a pan on the stove until they smell nutty and are lightly browned. Mix hot nuts in with the cheese mixture. Taste for seasoning. Let it sit for a minute and then taste again. Toast or grill the bread. When it's still hot rub the garlic clove all over one side of each slice. The garlic will almost melt into the bread. Top with pesto, olive oil, and salt. Place pesto in a large bowl. Bring large pot of water to a boil. Add salt. Add pasta and cook until al dente. Reserve a mug of the pasta water before draining the pasta. Pour drained pasta over pesto. Add a tablespoon of the pasta water. Mix. If it's too dry add more pasta water and mix again. Grate parmesan cheese on top. Eat right away. Many root vegetables have different cooking times. Don't worry about this. It's actually nice to have different textures in this tart. Use an 8, 9, or 10 inch tart pan. 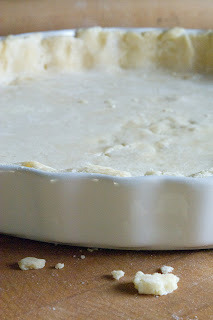 This tart would also be really good on puff pastry (easier too if store bought). My great chef friend Michael just let me know that the skin on late season delicata squash can be very tough -- use at your own risk or peel it to be safe. September/October/November delicata should be fine with the skin on. Peel the vegetables (unless it's delicata squash). Chop up vegetables into chunks that are approximately the same size (about the size of a quarter). Peel and slice the onions or shallots if using them. Leave the garlic unpeeled. Toss everything together on a sheet pan. Drizzle over some olive oil and balsamic vinegar. Add herbs and season generously with salt and pepper. Toss again until all vegetables are coated. Roast in the oven until vegetables are just getting tender but not mushy. Toss them around every 15 minutes or so. It's okay for them to caramelize and get crispy, maybe even the tips will burn a bit. This will take 30-40 minutes. Meanwhile, roll out pastry dough, press into a 9 inch tart pan. Trim or press off edges. Refrigerate. Once the vegetables are out of the oven, turn it down to 350°F. When oven temperature has dropped, bake tart shell until it just starts to smell nutty and buttery (about 10-12 minutes). Remove from oven. Leave oven on. 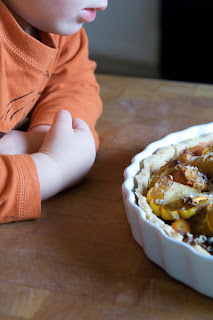 If your children are assembling the tart let it cool for a few minutes (otherwise go right ahead with the hot shell). Spread pesto evenly all over the bottom of the shell. Place partially roasted vegetables on top of the pesto. Put all the roasted garlic cloves in a pile in the center. Grate lots of parmesan all over the top of the tart. Bake for 30 minutes or so until the cheese and the tart shell are nicely browned. Amazing, as ever. The folks at the office got me a bi-weekly farm box for Christmas/Chanukah, and I'm having fun (though also feeling the pressure) cooking based on the ingredients. You know, based on seasons, like back in the day. Tonight I have an apple crisp in the oven and a white bean and leek soup on the stove. Lots of leeks (two boxes in a row). Wanted to fry some but realized I have no cornstarch or flour on hand, so pas de garnish for me. You are inspiring me! I might even have a kid one of these days. Yum! Makes me hungry right now! P.S. Beautiful baby girl was born in a perfectly peaceful and splendid natural birth. Thanks for your wisdom. late season delicata squash can develop an inedible skin, even after roasting/frying. just saying. good to know, mcecconi. i'll add a note about that to the recipe. our delicata was melt in your mouth tender last week. maybe it's the nyc squash. head west, my friend. hee hee. anything to get you guys out here for good. great post. I would love to follow you on twitter. By the way, did anyone hear that some chinese hacker had busted twitter yesterday again. if you have any pesto left, try mixing it with ground lamb for a yummy lamb burger. we had these tonight and they were delicious! what a great idea to add the pesto to ground lamb. can't wait to try it. thanks for the idea. When I read the description, my first two thoughts were: couscous and spaghetti squash -- both just variations on your ideas, but I can't wait to try it! Your children sound really amazing....so does the food but the children seem like a bigger accomplishment!